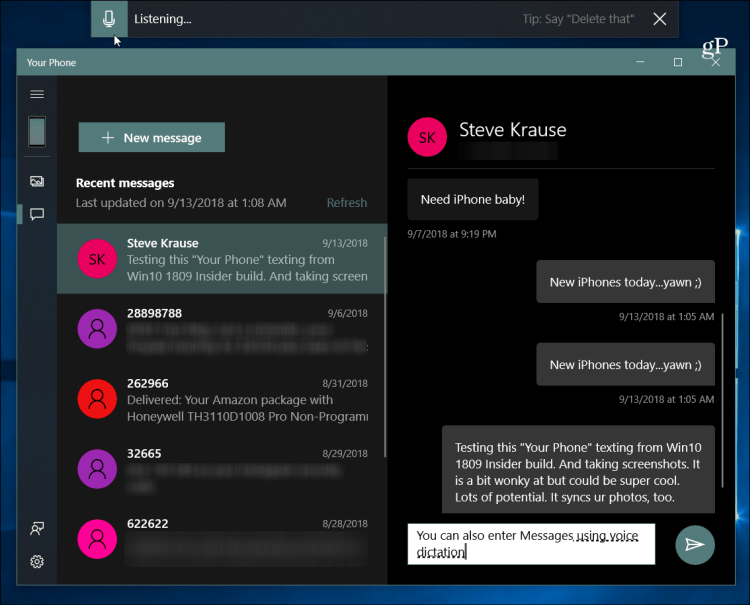 An interesting new features in Windows 10 October 2018 Update (version 1809) is Your Phone which allows you to send and receive texts from your PC. 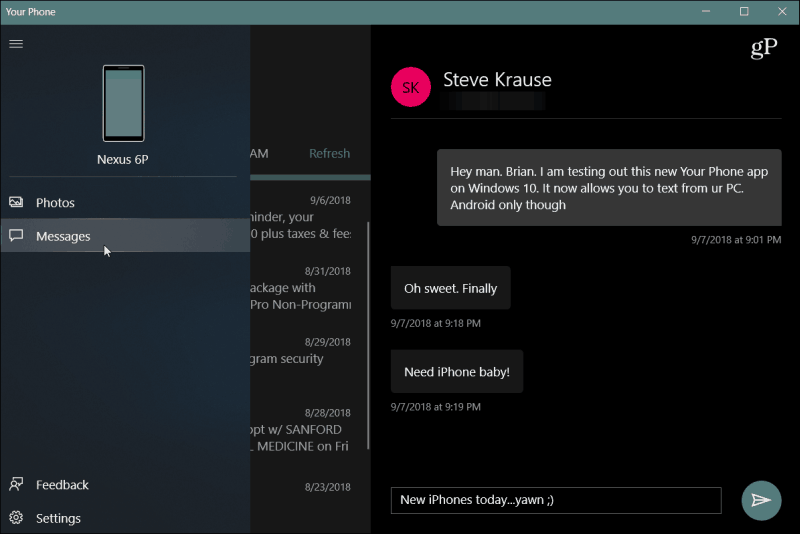 One of the new features in Window 10 October 2018 Update (Version 1809) is the Your Phone app. 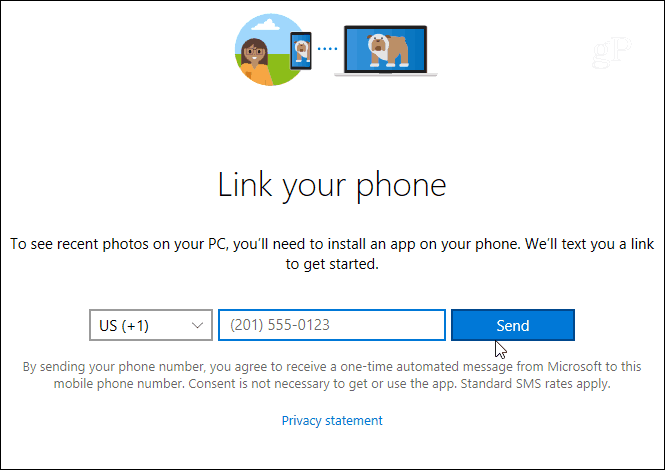 It allows you to connect your phone to your Windows 10 PC and sync texts, photos, and other items between devices. We’ve given you an early look at linking your Android phone to the app and syncing photos. And recently, the company added the ability to sync your SMS messages. Here is a look at using the new ability. For this article, we’ll assume you’ve already linked your phone. If you haven’t and need help with that, check out our previous Your Phone article. You just need to enter your phone number, download the app, and sign into your account. To send texts messages, launch the Your Phone app and click on “Messages” in the left panel. 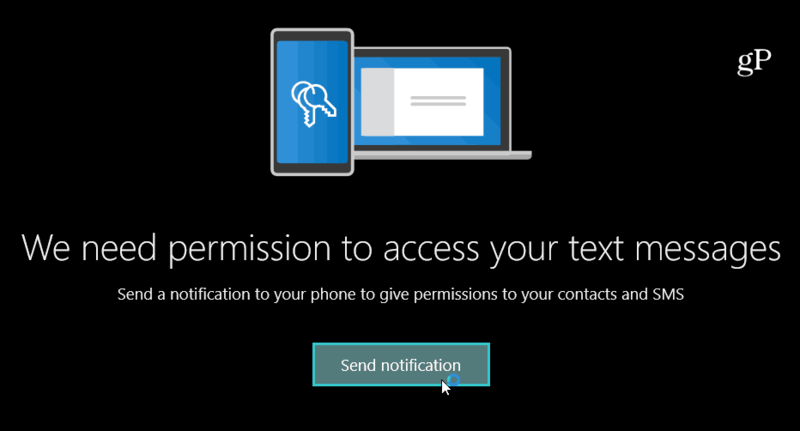 Click the “See texts button” and give Microsoft permission to access your messages. Then on your phone, confirm the notification to allow Your Phone to access your messages and contacts. After you’re connected, your contacts and previous messages will sync from your phone to the app. Sending texts from the app is a straight-forward process. Click the “New Message” button and search for the contact you need – either by name or number. Then type in your message in the text field and click Send. You can use the keyboard to type in your messages, or, if you have a touch-enabled device like a Surface, you can use your pen to write in your message which uses Microsoft Inking technology. And if you live in the U.S. you can use your voice to dictate a message. Hit Windows Key + H and a dictation box will open at the top of your screen and you can begin speaking. At the time of this writing, the Your Phone app is still in early development and it isn’t perfect. Sometimes your messages sync in real-time and at other times it can take several minutes. So, if you have an Android phone and you want to text from your PC, you might want to stick with Android Messages on the Web. But when it becomes available to everyone in the coming weeks, everything should be more stable. It’s also worth mentioning that it only supports Android because Apple doesn’t allow third-parties (like Your Phone) access to its SMS data.